I really enjoy playing fantasy football, even though I’m pretty terrible at it (this is also the case with actual football, but I digress). What I really want is the opportunity to fail at an EFL version – I remember a few seasons ago there was an official Championship one, but I’m not aware of any. Out of curiosity – and as a means of testing a half-finished line-up builder that I was working on – I’ve applied the official Premier League scoring system (which can be found here under Rules > Scoring) to each of the three EFL divisions to see what the best possible squad would be. Just like the official game, I’ve picked the best-scoring combination of two goalkeepers, five defenders, five midfielders and three forwards (hopefully without putting anyone into the wrong category), although if this were a real game you probably wouldn’t be able to afford to put all of them in the same team. 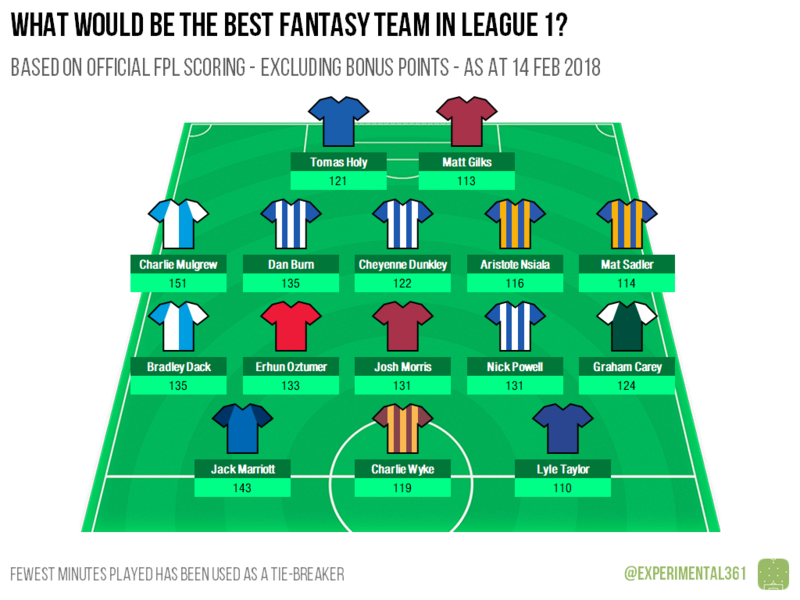 The only element of the scoring which I haven’t been able to apply is the bonus points, as these include stuff like tackles and passes for which there isn’t data available (at least to me). Also I think the FPL rules are a bit more generous around assists, but overall I think it gives a decent facsimile of what would happen if they rolled it out across the EFL. EDIT: I wasn’t expecting this to be so popular – getting a lot of questions about where specific players ranked, so I’ve put all the data into a Google Sheet here. Perhaps unsurprisingly there are six Wolves players in the 15-man squad, thanks in part to their whopping 17 clean sheets. There are also three from fellow high-fliers Derby and two from Bristol City. I suspect that classifying Ryan Sessegnon as a defender is increasingly inaccurate as he develops into a potent attacking threat, but as it stands he’s the top-scoring player in the whole EFL. By my reckoning he has 11 goals, four assists and seven clean sheets to add to 31 appearances of at least 60 minutes. Leaders Wigan have the most players (three) in the squad, while fellow promotion-chasers Blackburn, Shrewsbury and Scunthorpe have two each. 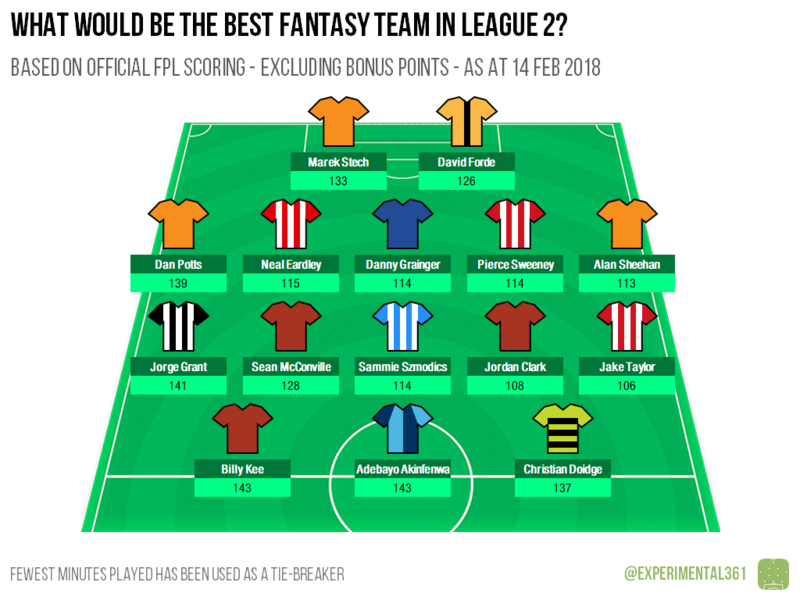 Again it’s a defender who tops the list, with Rovers’ Charlie Mulgrew’s 12 goals seeing him edge out Jack Marriott of Peterborough. There’s some argument that Mulgrew should be classified as a midfielder, although he appears to be deployed regularly at centre back. There are three players apiece from Luton (surprisingly all defensive ones despite their free-scoring antics) and Accrington – the Hatters’ top-scoring striker, James Collins, misses the cut with 126 points (ranking him 6th among fourth tier forwards). Exeter are the only other club with more than one representative. Ex-Torquay strikers Adebayo Akinfenwa and Billy Kee are tied for the division’s best-scoring player, with Kee edging it overall by virtue of having played fewer minutes this season. Their contributions are quite different, with Akinfenwa’s 14 goals and 10 assists making him more of a provider than Kee (with 18 goals and 4 assists). Note: It would be remiss of me not to plug the fine work of my PA colleagues Pete Fabianski and Tom White, who provide valuable weekly FPL advice such as this.